With GREEN LANTERN: EARTH ONE now in stores, we’re taking a look at the Earth One books in general, revisiting the now-classic standalone tales that set the stage for the newest graphic novel. I absolutely 1,000% adore the Earth One line of standalone graphic novels that DC has been publishing since 2010. It provides consistently refreshing takes on some of the company’s most beloved characters. Now, I know you might be thinking to yourself that this same thing can be accomplished by a good, old fashioned reboot or the welcoming of a new creative team onto a title—and you are definitely not wrong. What Earth One does that a standard reboot can’t do is tilt the perspective with which the character is approached. This is cool because when it is at its very finest, as it is in the case of Geoff Johns and Gary Frank’s collaboration on BATMAN: EARTH ONE, it offers up a completely new perspective than the one you might be familiar with over the course of your years spent as a comic book fan. Batman: Earth One opens with a stunning sequence drawn by Frank that ought to be examined by whoever winds up making the next Batman solo movie. It’s so moody and so wonderful and, while it feels familiar, there is an edge to it. Batman’s younger and inexperienced, and that inexperience definitely shows through. The sequence is not necessarily scarier or harsher, but it’s definitely cooler, and even a bit humorous at times (but not campy—this is still a serious take on the Dark Knight). I especially love the Earth One costume. I’ve always been a sucker for a lot of grey in the Batsuit design and this is one of my favorite examples from the contemporary era of comics. The cowl and the way the cowl is colored by Brad Anderson has fascinated me since I first read volume one when it originally debuted in 2012. Most cowls and domino masks are colored as if the superhero underneath the mask is wearing severe eye makeup underneath with the shade or tone of the mask bleeding all the way down to the whites of their eyes. In this story, you can see the skin that is peeking out from beneath the cowl. Quite often you can even see Bruce Wayne’s eyelashes—not a physical trait that is common to male vigilantes. I would love to read what your thoughts might be on this Batsuit in particular down in the comments section. So if you want to head down there early in the course of this article, here’s a good place to do it! 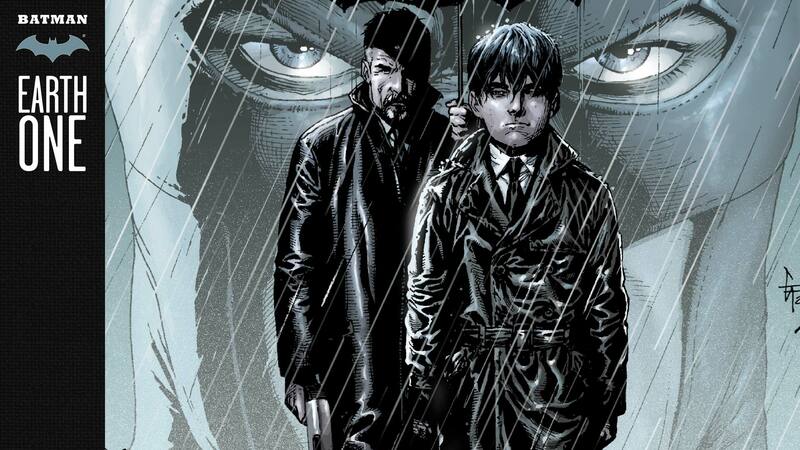 Batman’s origin is still in place with the Waynes’ death at a paramount moment of development in young Bruce’s life. This aspect doesn’t stray nearly as far afield as something like the BATMAN: FLASHPOINT tie-in miniseries (which I also think is totally great and if you are into Elseworld stories you should absolutely be picking up to read). In Batman: Earth One the greatest divergence comes in the form of Alfred Pennyworth. Have no fear, my Pennyworth fans, Alfred is still securely in place and very present post-death-of-Thomas-and-Martha. However, he’s a lot more rough-and-tumble and less refined than we are used to thinking of him. Imagine the opposite of your beloved Batman: The Animated Series Alfred and someone who is much more akin to Daniel Craig in the James Bond franchise of movies. If I were to make a guess, I would assume that Johns got really into the idea that Alfred had a history of military service. This has been a longstanding trait of Alfred that has been explored in the past, but never in this way. Alfred is tough and he believes in what many would consider an antiquated rub-dirt-in-your-eye approach to child rearing when he suddenly finds himself straddled with the custody of child Bruce Wayne. While we do see flashbacks throughout Batman: Earth One, most of Bruce’s training culminates during the events of this initial graphic novel. There’s even a totally and completely badass fight between adult Bruce and old man Alfred (who has some long-standing injuries), that is stunningly choreographed by Frank in a way that allows you to feel just how competitive these two men are against each other and just how much they do actually love each other…even if they are likely incapable of ever being able to articulate this. Interestingly, this take on Alfred seems to have at least partially inspired the version on Gotham, who also has a military background, is largely responsible for young Bruce’s training and is more than able to hold his own in a fistfight. Heck, we even recently saw Bruce and Alfred get in a pretty brutal fight recently, so the parallels are definitely there, if you’re a fan of Gotham. But let’s get back to Earth One. Once Alfred and Bruce get collectively on board with the idea of Batman and what he is going to mean to Gotham City, Batman: Earth One gets to play at introducing other popular canon characters and rebuilding how they fit into this unique and dangerous reality. Penguin, who I’ve always thought is a criminally underrated villain, pops up as a vehicle to introduce Earth One’s Jim Gordon, complete with red hair. This is a very harried Gordon compared to the tired elder statesman that always comes to mind when I think of the head of the Gordon family. The parallel narratives of Batman and Gordon attempting to carve out their respective places while simultaneously trying to work together just makes for a super cool origin and a nice throwback to Frank Miller’s BATMAN: YEAR ONE. Lucky for you, if you are thinking about picking up Batman: Earth One—or you already have and you know you like it—there are future volumes that you can dive into. Volume one is very much an origin, albeit a very good one, and it opens up for some deeper character explorations and more camera tilts as we get used to what this version of Batman looks like. Volume two defines this take on the character even more and introduces a young, unhinged take on the Riddler, and Johns and Frank have promised a volume three down the line. But if you haven’t read any of Batman: Earth One yet, start here. You’ll be surprised how much a Batman comic can surprise you. Ashley V. Robinson writes about the DC Universe for DCComics.com and covers The Flash for the #DCTV Couch Club. Look for her on Twitter at @AshleyVRobinson. BATMAN: EARTH ONE VOLS. 1-2 by Geoff Johns and Gary Frank are available in print or as a digital download. Look for the newest Earth One graphic novel, GREEN LANTERN: EARTH ONE, now in comic shops.